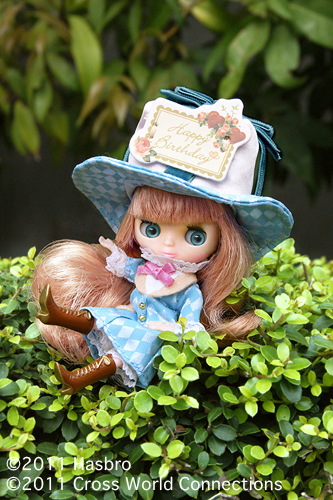 Birthday Party Surprise is wearing ?a unique hat in the shape of gift box. She chose the coat-style dress for the big 10th anniversary party! The coat is　diamond-patterned dress with an A-line silhouette. 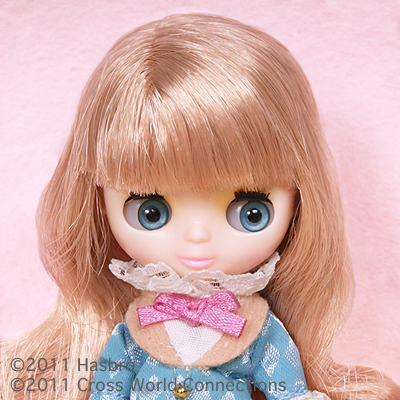 The gold buttons and pink　ribbon at the neck adds a festive mood to her coordination. The coat has a light brown collar and pocket made out of felt. There is lovely delicate lace around the collar and cuffs. 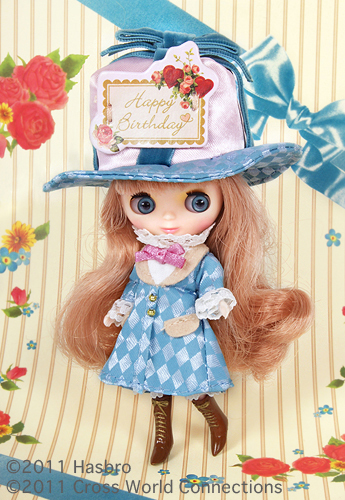 Her gift box shaped hat is pale pink made out of satin, and the brim is the same　fabric as her coat. 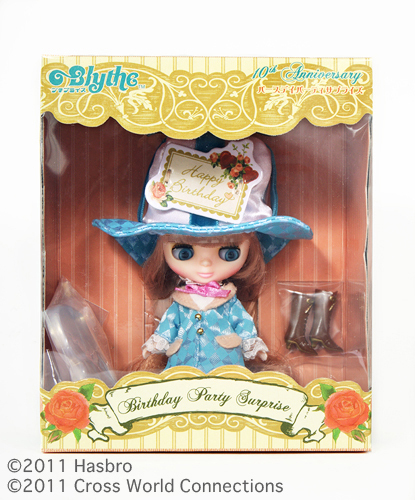 The bow on her hat is the signature motif for all of the 10th anniversary dolls. 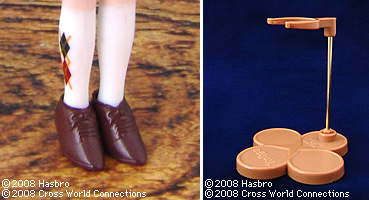 Her brown lace-up boots are painted with gold around the lacing. Her hair long hair reaches to her feet with sweet bangs in a　pinkish-brown color. Her eyeshadow is opalescent yellow-beige and her blush and lips are in cherry pink. She has special long eyelashes that make a lovely wide-eyed expression. She has a natural skin tone. 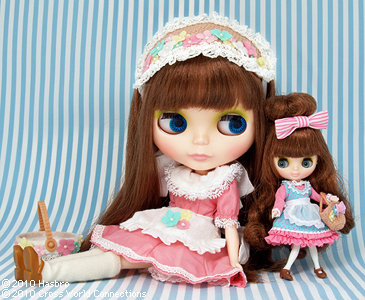 Collaboration Petite Blythe with Saki Yamashita, "Baby Buttercup"! 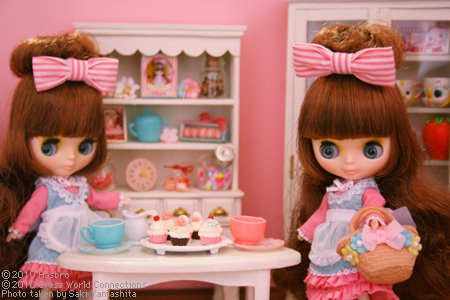 Exciting news for Petite Blythe lovers! 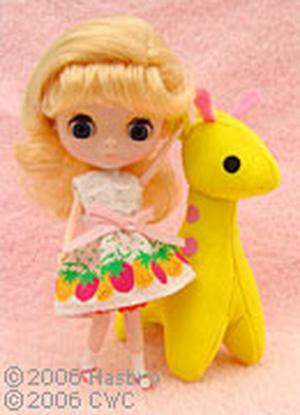 A new Petite Blythe "Baby Buttercup" will be released soon, and it is a collaboration Petite Blythe with the CWC Original Blythe Artist, Saki Yamashita, also known as CHERRY MERRY MUFFIN! "I have been invited to a tea party today. My best friend is baking the yummiest vanilla cupcakes and serving beautiful caramel milk tea. I'm so happy to see her again! We love all the same things, especially each other! Baby Buttercup wears a pink long sleeve shirt trimmed with sweet lace and ribbon. On the blouse, She chooses a light blue dress with small pink polka dots. The dress has a little lace on the neck and double frills at the bottom for the cute accent. The frills are made with the matching pink cotton fabric with the blouse inside. An organdy apron is made in the signature "CHERRY MERRY MUFFIN" style. When she goes out, she always carries her colorful basket decorated with flowers and ribbon. Inside of the basket is lined with a pink fabric. 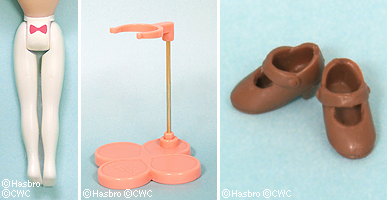 The brown strap shoes are a perfect match for the Baby Buttercup's lovely style, and they are a brand new mold! Her hair is a wavy long hair with bangs, and the hair color is same dark brown as Baby's Breath. The hair style is very unique. A sweet bun pulls up the sides of her hair while the back is long and lovely. Her cute bangs and hime cut sides frame her face so cutely! A big stripe bow cutely ties the hair. The sides are cut around the chin. Her skin color is Natural, and makeup is a green eye shadow with pink blush and lips. 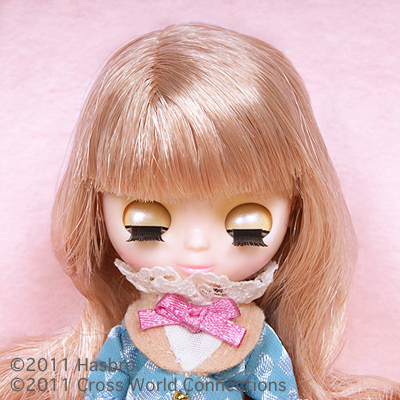 Her eyelids are a little darker then her skin tone to make her look like a Vintage Blythe. 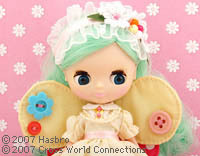 Her eyelashes are a bit longer than the stock for more expressive eyes. Her eye color is a gradation of light blue. The stand is orangy pink, and the bar is gold. 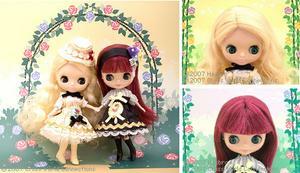 [ The set includes: ] Doll, blouse, dress, apron, bag, bow, shoes and stand. 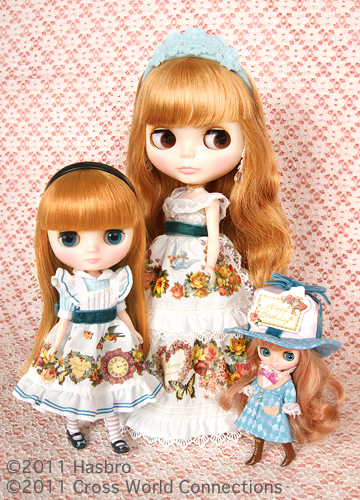 Jane Marple x Blythe! CWC Limited Petite Blythe "Bloomy Bloomsbury"
Jane Marple, a brand that has been bringing you innovative, liberating yet holding a wide range of followers, has collaborated with Petite Blythe! This is our final presentation. 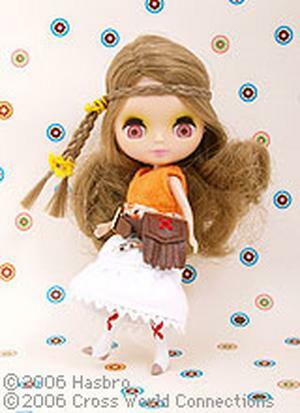 Bloomy Bloomsbury holds a diginified appearance, its slim outfit makes the doll very impressionable. Once her cape is off her white blouse made of tulle can be seen. It is an orderly and clear image. Her beret fits right on her head complimenting her pleat skirt, on top of that her skirt is embroidered with gold stitching spelling out "JM". Subtle accents of white lace on the pleat skirt and black pon-pons on her beret adds to her adorable look. Her socks are blue and red in an argyle pattern. 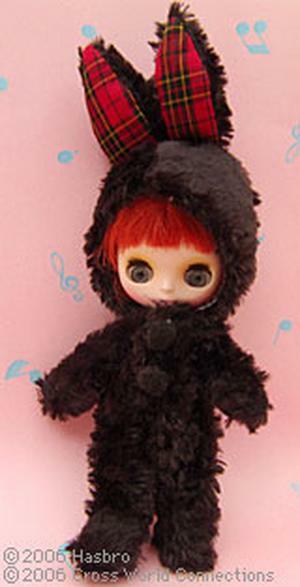 Once you put on her short dark brown boots Jane Marple's Petite Blythe is complete. The support post of her brown stand is specially colored gold bringing out a luxurious look. Her hair style is put up divided in two in a mixture of two different browns, the left and the right side of the hair is purposely different in height giving a very creative and asymmetrical dynamic. Her make up is a calm orange and beige complimenting her light blue eyes. 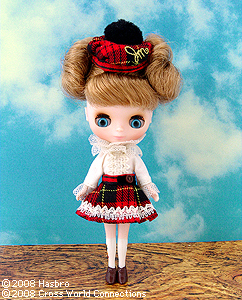 Petite Blythe "Bloomy Bloomsbury" will be a great gift for this winter season! 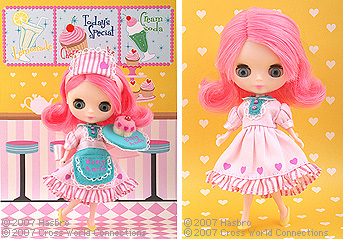 It will be available before the Neo Blythe "Bloomy Bloomsbury". Please look forward for its production update! 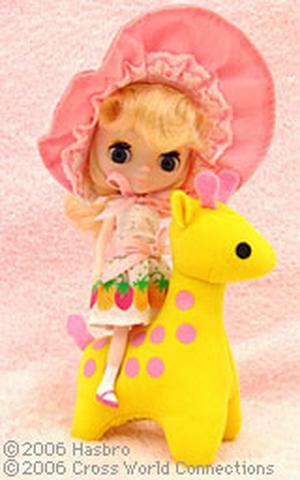 **Petite Blythe "Bloomy Bloomsbury" purchase process will be noted on a latter dater on this site. 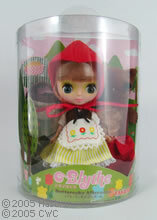 [ The set includes: ] Doll, cape, blouse, skirt, beret, short boots, and stand. 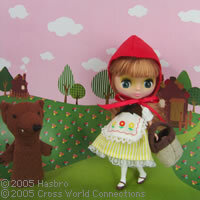 Petite Blythe "Bebe Babushka" lives in a small village in Russia. She has a fair skin with soft colored makeup. Her hair is ash blonde with a stylish center-part. Her eye color is a beautiful light purple. 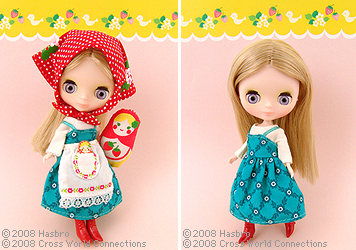 The matryoshka-themed outfit looks cheerful and pop, which shows her unique character. 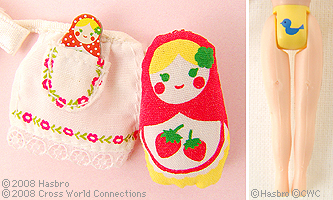 She comes with a little matryoshka stuffed doll. There is one more news! 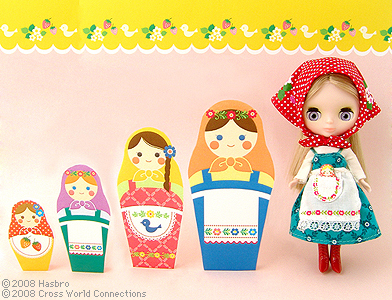 The matryoshka-themed Neo Blythe "Matryoshka Maiden" will be released this December! She is inspired by Russian girls with beautiful blonde hair and fair skin. 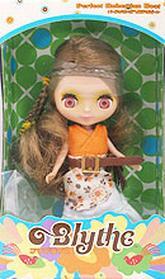 "Matryoshka Maiden" comes with Fair skin type and Radiance mold. These Petite and Neo will be perfect friends! 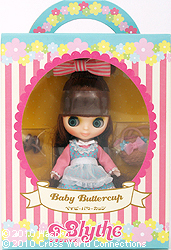 ◆Toys"R"Us Limited Edition Petite Blythe "Bebe Babushka"
The new Little Lodge features a motif of traditional kokeshi dolls and pandas that harken back to the fun and funky style of the Showa era. The exterior is baby pink and the interior is turquoise. 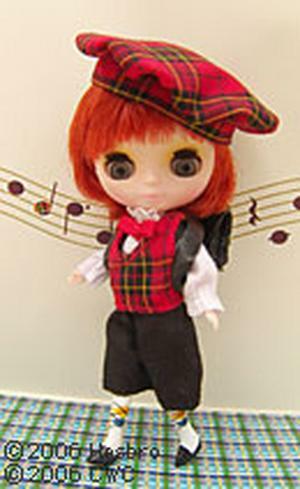 The doll that comes with the lodge, is a variation of the popular "Tokyo Toddler". We coordinated "Baby Bonnie's" outfit in a cute retro style echoing the pink and turquoise colors for the Little Lodge itself! The outcome is "Baby Bonnie". 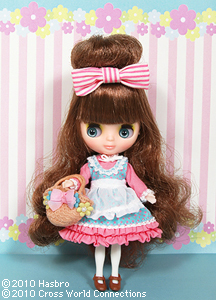 Petite Blythe Baby Bonnie has shoulder length, light brown hair with straight bangs. Her eyes are bluish green with a forward gaze. Her blush and lips are a delicate pink, tinted with a light brown touch to bringing out the nostalgic palette of the Showa era. 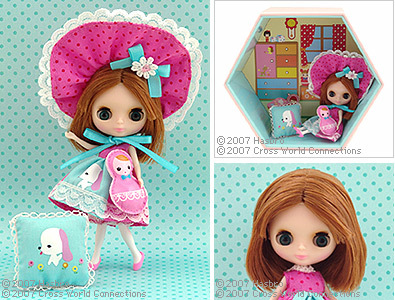 The set also comes with a cushion and a plush toy, it completes the look of her retro Showa room! You can display this Little Lodge by itself, or combine them with you other Little Lodge collection! You may also purchase the lodge by itself with out the doll, but Petite Blythe "Baby Bonnie" will only be sold as part of the set. *Toys "R" us LE Petite Blythe "Betty Ann's Diner"
Come to "Betty Ann's Diner" after your bowling game, and enjoy her delicious cupcakes and lemonade! 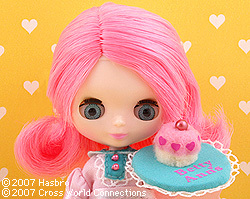 Petite Blythe "Betty Ann's Diner" has a fresh pink and teal color theme. From the pink beads on her dress to the adorable heart print, she looks just as sweet as the cupcakes she serves! Her bright pink hair is long with bangs. Her look is truly retro with her cute hair flip! She wears light green eye-shadow, pink blush and pink lipstick. Her eye color is a beautiful sky-blue with a forward gaze. She has fair skin that really brings out the fun colors of her outfit! 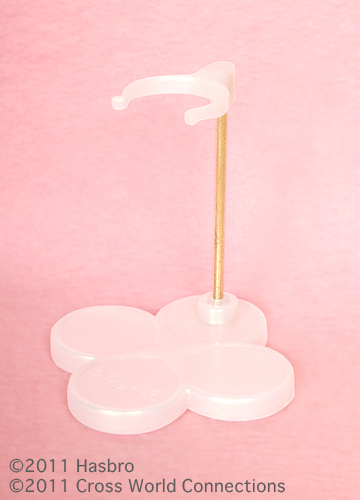 Be sure to pick up this retro sweet Petite while supplies last! 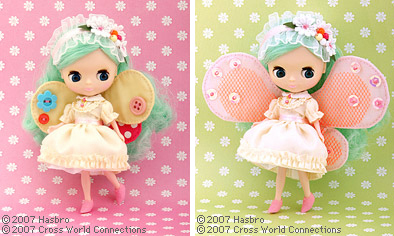 Butterfly Wings is a butterfly girl who loves to dress up! She changes her wings as she pleases. Lets go to the flower field with Butterfly Wings!? Butterfly Wings loves to be fashionable. She likes to change her wings depending on her mood! 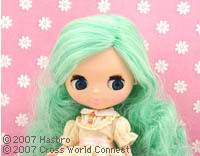 She has blue eyes (new color/looking left) and she is so proud of her long, curly light green hair. She is wearing cream colored feminine dress, and blooming floral bonnet. The two adorable pairs of wings, shiny pink and light cream with polka dots. Both sets of wings are included! They are so cute it's hard to choose which style for her to wear first! Doll (Tip-Toe), dress, petticoat, bonnet, 2 sets of wings, shoes, and stand. CWC limited Petite Blythe "Bird Song Duet"
The sweet little sister birds, Emma and Melanie, are the Petite Blythe set "Bird Song Duet." Their beautiful voices bring joy and harmony to the hearts of those who hear their beautiful song. 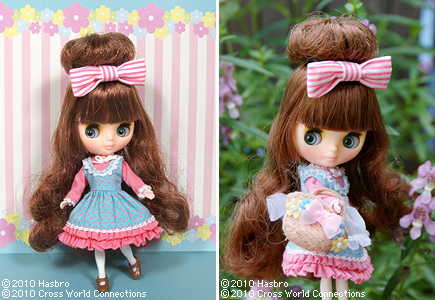 By the magic of Princess a la mode's unconditional love, they turn into human girls! Emma has platinum blond hair with beautiful curls. Her gold eye shadow echoes the soft beauty of her golden ringlets. Her light cream dress is embellished with beautiful lace and a lovely rose cameo, fit for a princess! Her soft and sweet beauty is topped off with her lovely cream colored hat!Melanie has wine colored hair, styled straight with bangs. 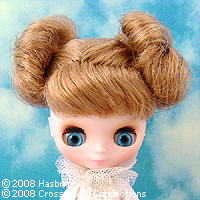 Her eye shadow is a lovely cafe au lait shade, with the same color eyes as her sister Emma. Melanie's dress is a bold black and white accented with a beautiful bird broach. She wears a black headband with flowers. When you place these two sisters side-by-side it seems like they are looking at each other lovingly.